Congratulations to Amanda Evans of John Street Resolven, who represented Wales in a recent international pools competition held on the island of Malta. 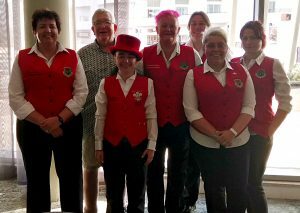 After three years in the Welsh Ladies’ B team, Amanda was chosen for the top A side for the first time and she and her team mates did exceptionally well against women pool players from nine nations including Australia, Scotland, England and Northern Ireland. –winning one more frame would have placed them in the semi- final. The Welsh team had one unexpected supporter in Malta, when Borough Councillor Des Davies walked through the door! Des was on the island recuperating after a recent period of ill health. Des is looking back on form in this photo and we wish him the very best of health in 2018. The New Year will bring more international appearances for Amanda who has already qualified to play for Wales in 2018. She is now the 4th best in the country-beating over 50 players to get there.